A recent "She Says" survey, conducted by Pink Tank, a division of GSW Worldwide specializing in women and health, and Meredith Research Solutions, has been cited to show that "women are highly cynical about pharmaceutical marketing efforts, with 56% of those surveyed believing that pharmaceutical marketing does more harm than good" (see "'Ka-Boomers' blow up more perceptions of pharma advertising"). That's nothing new to me and not the most important piece of information I got from this study, which you can find here. The most important insight I received from this survey is that these women -- whose MEDIAN age is 53.1 years! 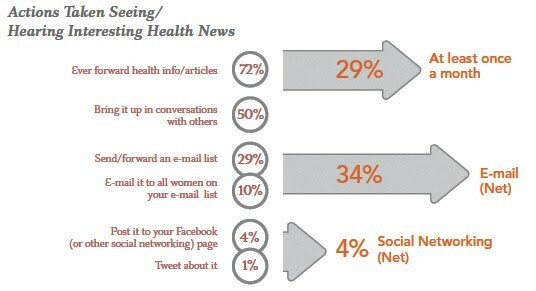 -- shun social media and favor email for spreading interesting health news via the Internet (see chart below). Click on the chart to enlarge. Sorry if this chart is difficult to read, but the "pink tank" pdf survey summary is so muted with feminine colors that it is very difficult to read with my baby-boomer eyes! I had to darken the image in PhotoShop considerably to get even this barely readable version. I guess the report is not meant to be read by the half of the survey respondents who are over 53.1 years old! Whatever! The point is that only 4% of these baby boomer women (MEDIAN age = 53.1 years) use social media to discuss and share interesting health information with their peers. Only 1% (a rounding error) use Twitter for that purpose. Meanwhile, 34% of these women use good old, antiquated Email! As reported in MedAd Blog, "Based on the survey results, Ms. Goffe-Wagner [senior VP and brand manager for Pink Tank] says there are some tactics pharmaceutical companies should be following when evaluating their marketing. 'When the brand is all about itself, women feel, as one put it in the survey, that it's patient before pocketbook,' [sic? should this read 'pocketbook before patient'?] Ms. Goffe-Wagner says. 'That’s the lens they are looking at; they are looking at what you say, and what you do, to see whether they feel that you’re just all about growing sales of your brand, or whether you’re really about improving health and the lives of women." Another tactic that pharmaceutical companies should be following is to use Email to reach these women rather than social media. BTW, I would be interested in seeing how women in different age groups feel about the issues studied in this survey. For example, women between the ages of 18 and 44 years may be more likely to use social media and 46.6% of them are using at least one prescription drug according to the survey.